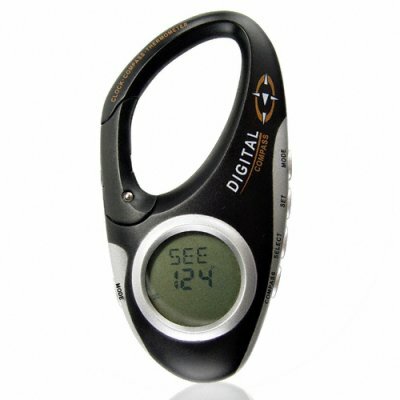 Successfully Added Digital Compass Carabiner with Thermometer and Clock to your Shopping Cart. This awesome carabiner style electronic gadget houses a clock, compass, stopwatch and thermometer - perfect for taking on those long walking trips in the city or countryside. This urban gadget is great for attaching to your backpack, belt or bike when you plan to be outdoors. The compass can be quickly used to see where you are heading while the thermometer can let you know how cold it is. The clock and stopwatch area addition useful items enabling timing accuracy, great for occasions where you do not want to carry around a cellphone or other heavy / bulky items. A great gift for those people who "have it all" or a very interesting item to attach to your backpack or bike. Order yours now, in stock in our warehouse right now for single piece or larger bulk stock orders. Click "add to cart" to get yours today.